A private concert and comedy set in the Grate Room featuring The Unauthorized Rolling Stones and Comedian Steve Bruner, Master of Ceremonies. Grateful Dead member Phil Lesh’s Terrapin Crossroads opens its private concert hall to Big Brothers Big Sisters of the Bay Area supporters. Featuring incredible live music, dancing, comedy, a live auction and delicious drinks and bites, this special event will raise funds for life-changing mentoring to defend kids potential, one relationship at a time. 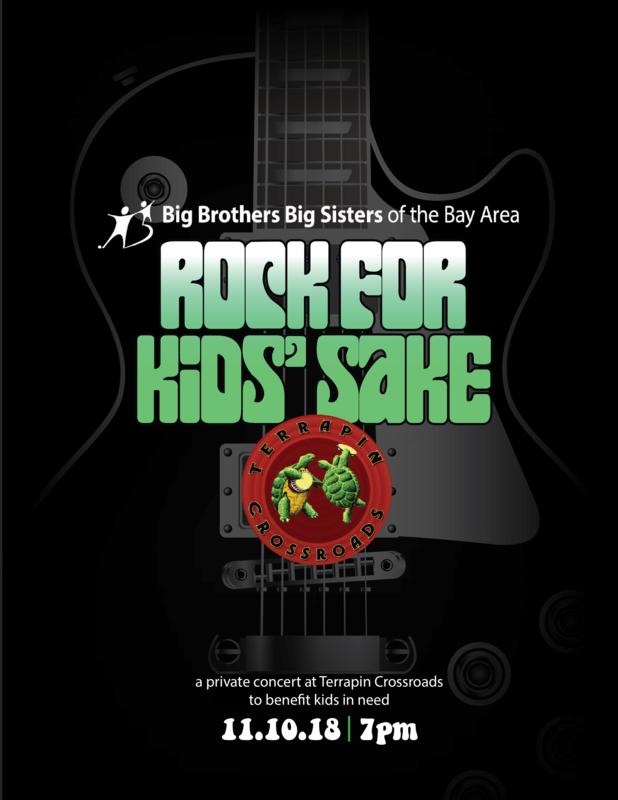 An exciting new take on the traditional Evening of Inspiration, Rock For Kids’ Sake will offer a great time at a lower ticket price than our formal gala, while returning more funds to support programs for Bay Area kids. Along with extraordinary live music, comedy, cocktails and hors d’oeuvres, you’ll get a special first glimpse at Big Brothers Big Sisters new national rebranding from Dawn Kruger, CEO. The San Francisco Chronicle’s “The Music Never Stops in San Rafael” traces the deep history of the Grateful Dead and other musical luminaries to the present day music venue, Terrapin Crossroads. You’ll get the full experience with the Unauthorized Rolling Stones, a renowned Bay Area band with nationwide appeal, playing with major entertainers like Elton John. Master of Ceremonies Steve Bruner has delivered his laser-sharp humor on Comedy Club Network and An Evening at the Improv, and written material for The Tonight Show with Jay Leno, The Byron Allen Show, and Comic Strip Live. He’s known for his unique brand of intelligent, incisive yet clean humor, and his exceptional experience he creates as emcee. General tickets are $100 and include two drinks and hors d’oeuvres. VIP and Sponsor Packages are $300 to $10,000, and feature seating by the stage, upgraded drinks, valet parking and more.